« Why Supporting Others Supports You. Letting Go of Delusional Thinking: How to Enjoy the Roller Coaster Ride of Life. Today we ask that you watch out for delusional thinking. Crazy people who commit terrible acts of violence are, of course, extremely delusional. But there are “garden variety” forms of delusion, which if left unwatched, can spring up into malignant growths within the consciousness. Delusions always have an element of grandiosity. Delusional people are grandiose in their thinking. They may fantasize that they are undiscovered messiahs, celebrities, or heroes. This usually goes hand in hand with paranoid feelings and thoughts around being oppressed and victimized in very singular ways. They ride an emotional roller coaster — feeling very grand and inflated one moment, downtrodden and crushed the next. 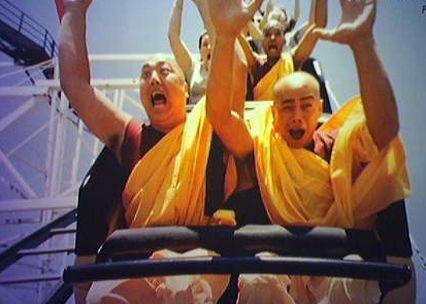 This roller coaster experience is quite commonplace — but it is a warning sign of delusional thinking. Do what you do out of love, and a genuine desire to create goodness in the world. But it is not about inflating your ego, proving your specialness, or becoming some kind of celebrity, or messiah. If any part of you is seeking this, you are sooner or later destined for an ego-deflating smack down, which you may experience as crushing disappointment, victimization, or that the universe is somehow against you. But most people have experienced the “garden variety” form of this at some point in their lives. Usually it happens when you build up a great expectation around some situation — like the idealized fantasy wedding, or the idealized fantasy of motherhood, or the idealized fantasy of ego-gratifying career success. Suddenly, the bubble is popped, and there is a crash. So just watch out for this tendency. This does not mean, you shouldn’t have dreams. Just look at your motivations. Are you doing what you do out of love, or a desire for ego gratification? If you can gain this clarity, the experience of life will not feel like such a roller coaster. Or rather, you will enjoy the ride much more — instead of feeling so crushed and depressed by the “lows.” This is called, gaining equanimity. Do what you out of love, and a genuine desire to create light, meaning, and beauty in this world. Then it will not be about “you” so much. And if it’s not about “you,” there will be much less drama in your life experience. You will just enjoy the ride.